Well, it's that time of the month again, where I get really cranky and a bit bloated and... wait! I'm thinking of something else. Also, I'm a guy. What I meant to say was it's been about a month since I updated the long-term charts, and there has been at least one significant development since then. 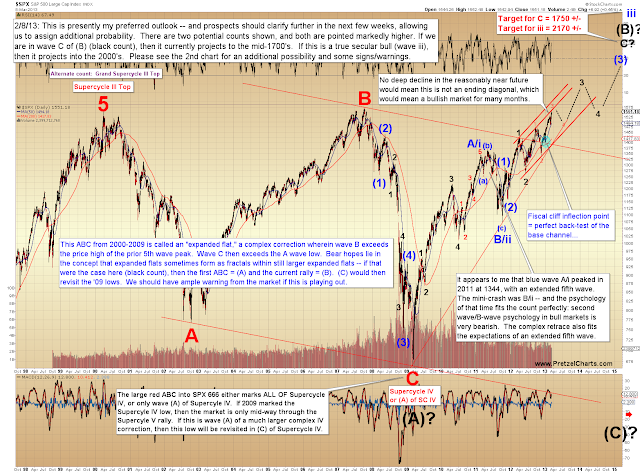 Last time we looked at the long-term, there was still potential for two versions of the bearish count. Since then, the alternate version of that count has been eliminated, so that allows me to narrow the long-term outlook down to two high probability potentials. Let's look at the bear version first, since a lot of folks are wondering if the potential exists for a meaningful turn in the near future. Indeed that potential does exist, as green wave iv would need to retrace back into the price territory of green wave i for this pattern to remain valid. 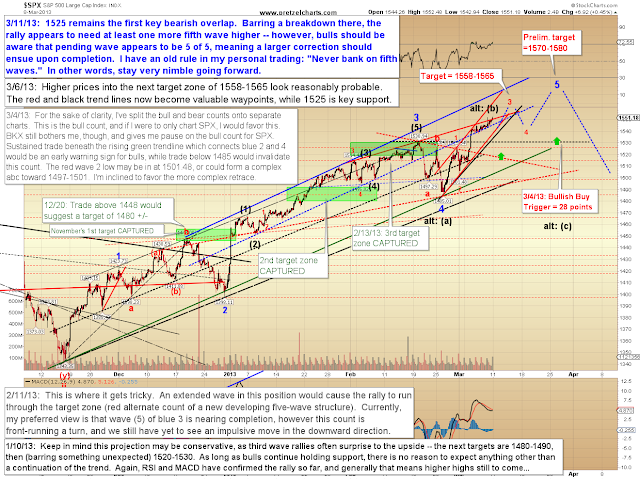 Ultimately this wave count would still see one more new high before a long-term turn. Given the deteriorating situation in Europe, this count does not seem at all unreasonable from a fundamental perspective. If the rally continues unabated, to the point where the two red trend lines which bound the diagonal no longer can be drawn as converging, we'll have our first real clue that the more bullish count (shown next) is gaining real favor. At present, however, both counts remain viable -- so this bearish possibility does suggest that bulls should exercise real caution at current price levels. 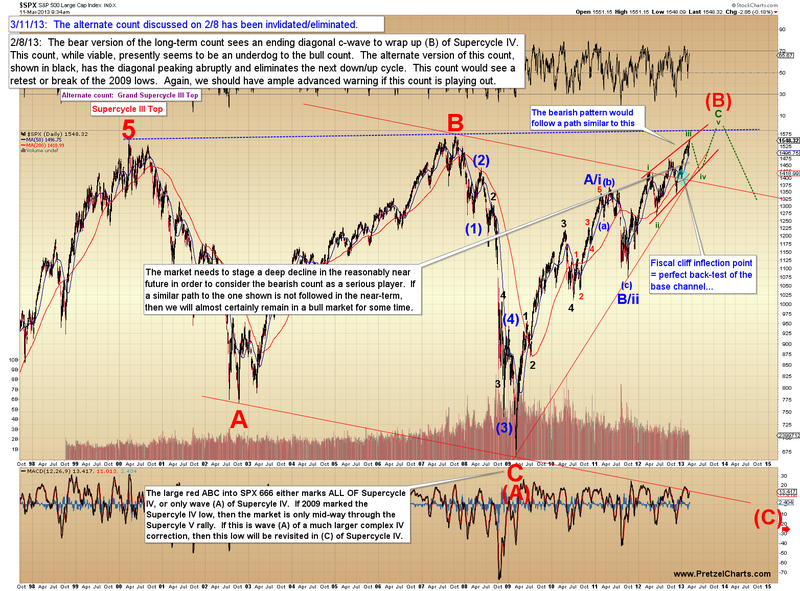 Next is the long-term bullish interpretation of the wave structure. Note that this count also suggests that price is nearing a peak, however this interpretation suggests a much smaller peak and turn in red wave 4. If this is the market's intention, we normally would not expect to see red wave 4 break below the 1485 zone. This count would suggest an ongoing bull leg, with only corrections along the way. Moving on to the more near-term, on Friday the S&P 500 (SPX) cleared the 1550 level, and has thus declared that it is more likely to be in the midst of forming a five-wave impulsive move to the upside. As I noted on Thursday, there is no "true" invalidation level for the proposed expanded flat, so it remains an outside possibility -- but odds are against that pattern now, so it has lost the weight required to continue justifying its own separate chart, and is instead merely noted with the black "alt: (a)/(b)/(c)" labels on the chart below. The market may be in the throes of a smaller degree fourth wave consolidation (not labeled), so may move sideways a bit before wrapping up red 3. Do please note the caveat on the chart annotation. Finally, a quick update to the near-term trend line chart. In conclusion, there's an old Chinese curse that translates: "May you live in interesting times." 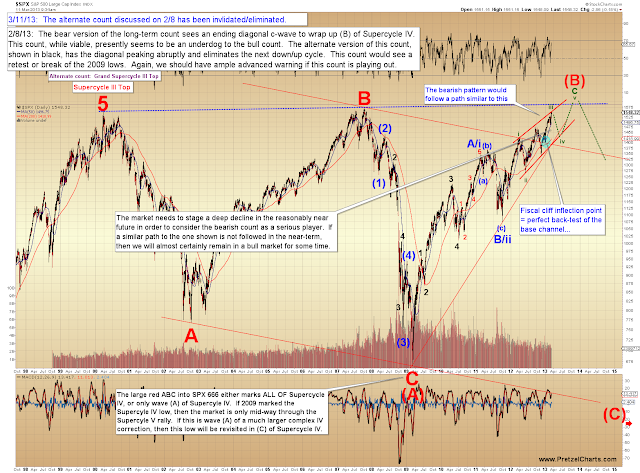 These are interesting times indeed, and for the moment, the long-term bull and bear potentials both remain viable. Over the near-term, it does appear more probable that the market will do a bit of backing and filling before advancing again into the wave 5 target zone. Sustained trade below 1525 would now be the first clue that something more bearish was unfolding. Trade safe. Thanks for the laugh PL ! It's almost difficult to believe that the market would not just keep going higher. Or perhaps I was hypnotized by Kenny Craig (from the Little Britain series in the UK) into buying more stocks no matter what. This has certainly been one incredible bull run. 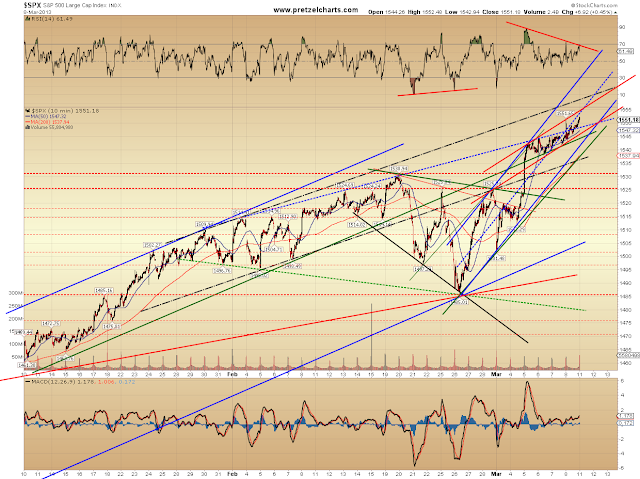 When the market was around 1525 and seemed to be having a hard time moving higher I thought ....correction coming,. Only to be completely surprised by the sudden one day jump from 1525 to 1543. But lately the market is just slowly grinding higher ??? Would not surprise me one bit if the SPX hit 1565 this week. Well, nothing goes up forever. I'm thinking just stay long an trail your stops till you hear every a**hole on CNBC confidently predicting the SPX hits 2000. Then, wait for a lower swing high and go short with a bullet. I've posted here once before and I wonder if you would accept me for access to the forum. Whoa, Pretzel, be careful. Our counts are converging down the stretch here.